This year is the 7th year that Patterson will be attending the American Association of Dental Office Managers, (AADOM), annual conference. It’s actually a milestone for us in that it is our 5th year as the Diamond Sponsor of this association. This year’s conference is going to be the best yet. The all star line up of speakers, starting with the Keynote Speaker, Linda Larsen, will be rocking the event. The educational sessions are so pertinent to what is occurring in the industry today, and of course the list of exhibitors is stellar. And of course… We’ll be in the main ballroom at our Patterson booth with some awesome new resources to share. This conference has become the go-to conference for Dental Office Managers every year. It hosts the best of the best in the dental industry, not only from a speaker/exhibitor standpoint, but from an attendee standpoint. I am always awed by the interaction with this group. You cannot help but come away from this conference excited about what you’ve learned, the connections you make with peers and the opportunities to put what you’ve learned to use back in your day to day activities. If you’ve not registered for the conference, don’t wait – space is limited! 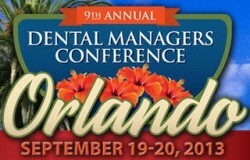 Visit the Dental Managers Conference website for details and registration. We believe our lasting partnership with AADOM has made a positive impact in hundreds of dental practices by providing access to expert information, collaboration and the latest technology resources. We hope you will join us in Orlando this September!